Twitter, for people without heads. Oh no - I lack head, limbs and the wheelchair! Personally, I see the katakana for 'hi'. Nice try, but the International Symbol of Access is 40some years old, and twitter isnt even a fifth of that. 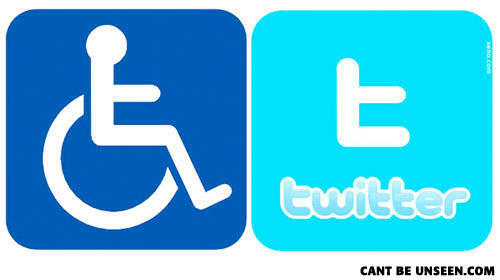 "Twitter, for disabled people without heads." So that's why no one likes twitter..
"Twitter, for people without heads." I don't think it's common to have no legs from the knee down, either. Google "twitter with his mind" and click the fist link. Q: What do you call a robot in a concert?